Recently advocates of CO2 catastrophic climate change have been trumpeting a new paper in PNAS by Kyle C. Cavanaugh et al :“Poleward expansion of mangroves is a threshold response to decreased frequency of extreme cold events” The authors argue “Our analyses provides evidence for a threshold response, with declining frequency of severe cold winter events allowing for poleward expansion of mangroves. Future warming may result in increases in mangrove cover beyond current latitudinal limits of mangrove forests, thereby altering the structure and function of these important coastal ecosystems." The authors, from the Smithsonian Environmental Research Center, use a bewildering array of statistics to suggest mangroves are marching northward along the coast of Florida only because climate change has resulted in just 1.4 fewer days with temperatures falling below -4C between 1984 and 2006. However the authors admitted "decreases in the frequency of extreme cold events was only significant if an extreme cold event was defined as colder than −4 °C; the relationship disappeared when the temperature threshold was raised a small amount" but they later implied this suggests just how sensitive the mangroves are too what most of us would see as an insignificant change. Their introduction also suggested that the authors were more interested in proving global warming than investigating all the confounding factors that may have also affected the increase in mangroves along their study site of the Indian River Lagoon. I was immediately suspicious because land use changes due to agriculture and urbanization have severely altered Florida’s hydrology and habitat. For decades disappearing mangroves have been a growing concern amongst conservationists. Nonetheless the authors claimed the spread of new mangroves were "uncorrelated with changes in mean annual temperature, mean annual precipitation, and land use." However I knew people who participated in Indian River Lagoon Shoreline Restoration Projects - Volunteer Events a few years back. That's the very area that the authors claimed the expansion of mangroves could only be explained by climate change. Yet these CO2 advocates ignored well-advertised activities such as the "Florida Department of Environmental Protection's Shoreline Restoration Project" which is working to identify suitable un-vegetated and disturbed shoreline areas to restore fringing mangrove habitats along the Indian River Lagoon. This is accomplished through planting red mangroves (Rhizophora mangle) and associated species, such as marsh grass (Spartina alterniflora). In April of 2010 there was a call for volunteers "needed to help with plantings, site maintenance, follow-up monitoring, and plant care at the mangrove nursery located on the grounds of the St. Sebastian River Preserve State Park. Planting events will be scheduled in the spring, and follow-up monitoring, site maintenance, and nursery work days are scheduled year round." So I sadly present the authors with my "Cheesy Climate Science Award" created in honor of past researchers who lead the way by hijacking conservation success stories and metamorphosing them into a climate catastrophe campaign as done in the IPCC paper here. Whether climate change is natural or man-made, we can make a more resilient environment by restoring habitat and watersheds. We must demand more critical thinking, so that such frivolous publications stop misrepresenting honest conservation efforts in order to create a picture of climate doom. Trustworthy environmental stewardship must be guided by better science. Below are comments that were added just after the original posting. 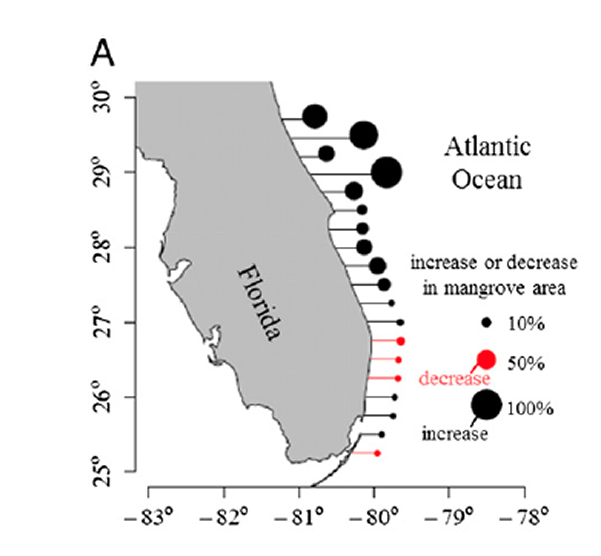 Florida's Mangroves were decimated as population pressures increased. 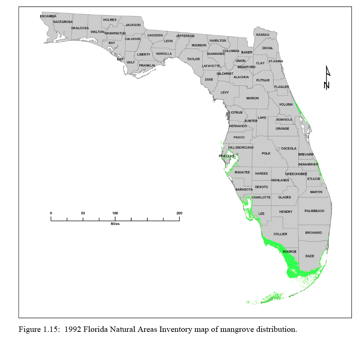 In graphs below, in 1967 mangroves inhabited the 2 most northern counties (red) but by 1992 (green) were absent as presented in the study by Davis, J. H. (1967), General map of natural vegetation of Florida, Gainesville, Fla., in Agricultural Experiment Stations Institute of Food and Agricultural Sciences University of Florida. 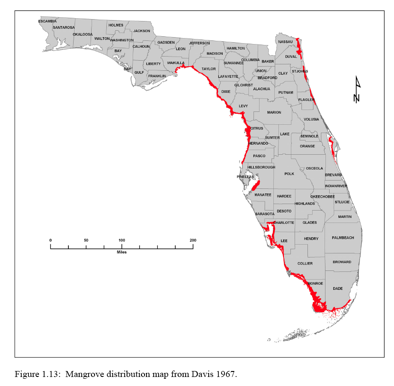 The fact that the northern extent of mangroves has not currently rebunded to its historic ranges when temperatures were cooler, was not discussed Cavanaugh's paper . There are several reasons for the destruction of mangroves. The Red Mangroves are primarily found along the coast. That species was pruned or removed because it blocked the views of expensive coastside dwellings. (1)(a) Any area in which 5 percent or more of the trimmed mangrove trees have been trimmed below 6 feet in height, except as provided in s. 403.9326(1)(c), (d), (f), (g), and (h), destroyed, defoliated, or removed as a result of trimming conducted under s. 403.9326 or s. 403.9327 must be restored or mitigated. Restoration must be accomplished by replanting mangroves, in the same location and of the same species as each mangrove destroyed, defoliated, removed, or trimmed, to achieve within 5 years a canopy area equivalent to the area destroyed, removed, defoliated, or trimmed; or mitigation must be accomplished by replanting offsite, in areas suitable for mangrove growth, mangroves to achieve within 5 years a canopy area equivalent to the area destroyed, removed, defoliated, or trimmed. 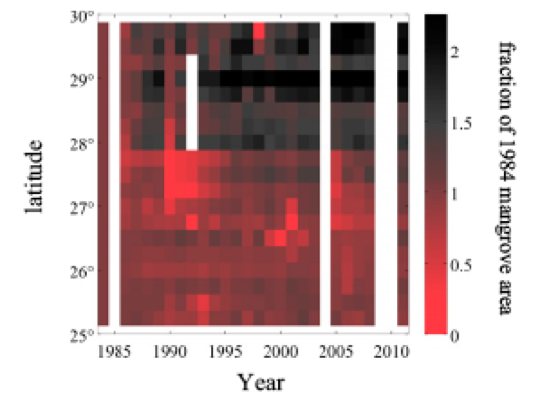 Much of Cavanaugh's "observed increase" in mangrove canopy cover occurs after the above law was instituted. Additionally, Florida’s coast had been managed to control for the insidious amount of saltwater marsh mosquitoes. Land managers in the 30s began building dikes to impound water and flood the marshes. That practice continued through the 70s. Flooding greatly reduced the amount of mosquitoes but also killed most of the black mangroves as seen below. Now those impoundments are no longer maintained, and mangrove swamps that were once decimated are now returning. The Tomoka Marsh Aquatic Preserve is home to many manatees. To improve habitat mosquito impoundments were stopped in 1980. 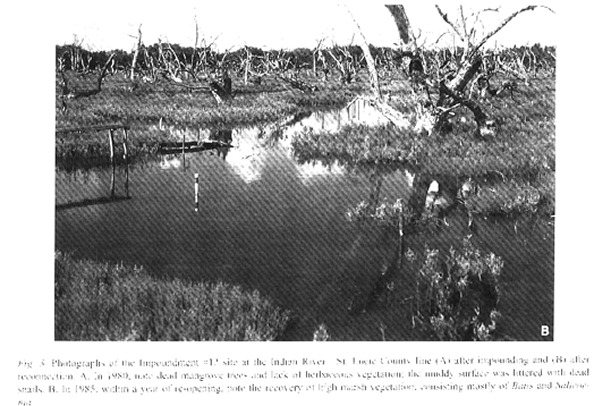 The preserve is located and at the northern latitude of 29.37 degrees in a region that Cavanaugh observed increasing mangroves (see illustration below). Yet without any discussion of these conservation efforts, they suggest it was climate change that was forcing the mangroves to march northward. Good science demands that all confounding factors be discussed and evaluated but in these days of climate fear, all a study needs to do is uncritically blame CO2 for any change. Such sloppy science is creating a growing distrust for legitimate conservation efforts. Hijacking good conservation is a disservice to us all! Finally as pointed out by Dr. Roger Pielke, the mangroves were decimated by extensive freezes in 1983. Much of the contrast between present and past canopy that Cavanaugh's paper attributed to global warming was an artifact of the canopy's recovery from the 1984 freeze. Starting their trend in 1984, the year immediately after the big freeze skewed the data. To appreciate just how misleading Cavanaugh's interpretation was, look at the uppermost row and find the bright red square representing 1998. Using Cavanaugh's logic, that means the northerly most mangroves retreated that year and were less abundant than observed in 1984. 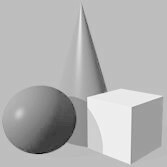 One would assume that a good scientist would ask, what other confounding factors would cause such observations. Instead the authors simply blamed climate change, and their bogus claim goes viral.